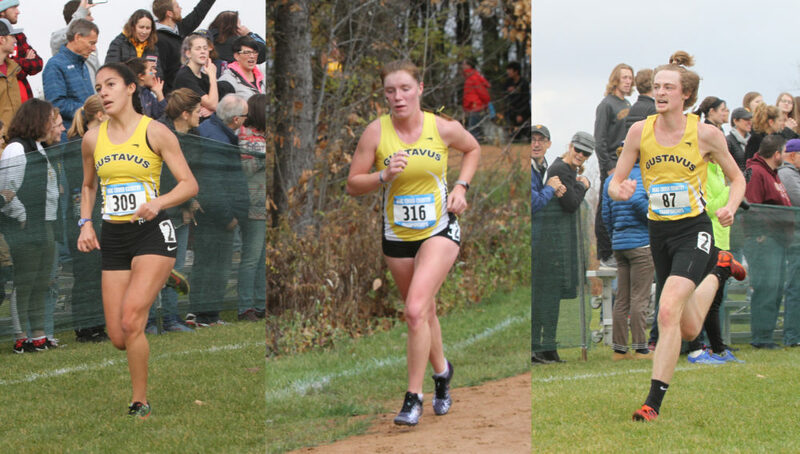 SAINT PETER, Minn. – The Gustavus men’s and women’s cross country teams had three total athletes receive USTFCCCA NCAA Division III Cross Country All-Region Honors for their performance at Saturday’s Regional meet at Wartburg. Andrew Stumbo (So., Boone, Iowa) received All-Region honors thanks to his eighth place finish at the Regional Meet. His eighth place finish is the best Gustavus placing in the Regional in over ten years. His time also qualified him for the NCAA Championship meet Saturday in Oshkosh, Wis. Tierney Winter (Jr., Waterville, Minn.), who finished 27th overall, and Iliana Ramon (Fy., Fairmont, Minn.) who finishing 29th, both garnered an All-Region nod as well thanks to their performances.